All Tools is an application, which allows more than 10 user tools to be started from a mikro IDE. It is a menu-based design, as opposed to a list of buttons, thus taking only one button space on the IDE. For each installed tool, two more applications can be executed, one before the tool, and the other, after the tool. 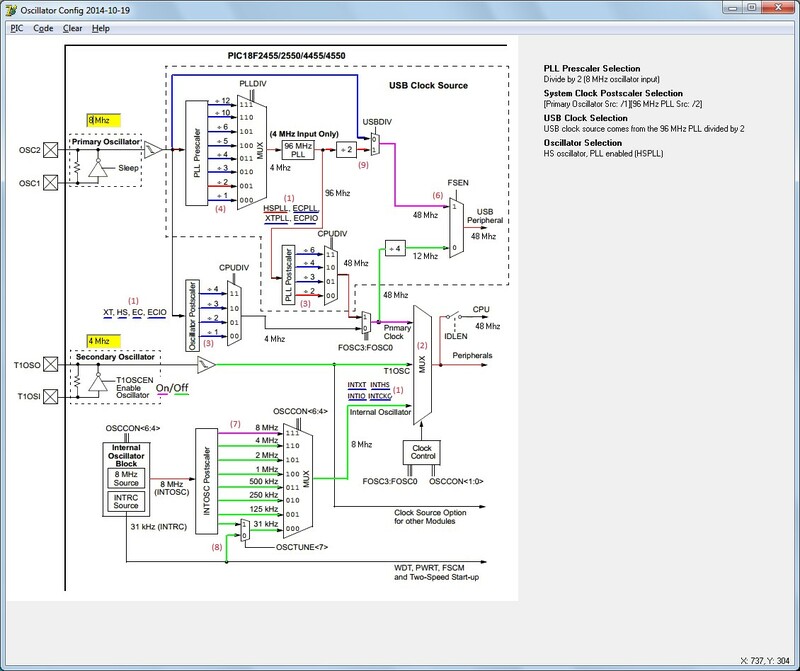 This tool helps, starting from the PIC18 or PIC24 oscillator block diagram, to define the oscillator related configuration settings (better known as "the configuration bits" or "fuses") and the oscillator initialisation code. It also shows, for a chosen configuration, the clock frequencies on several places in the oscillator diagram. Only a limited number of PIC18 and PIC24 devices are supported so far. 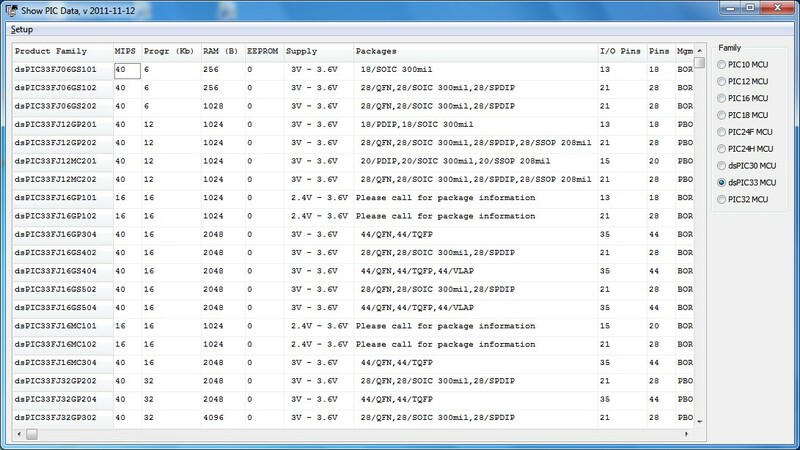 "Datasheet Manager" is a simple tool for organizing MCU datasheets. 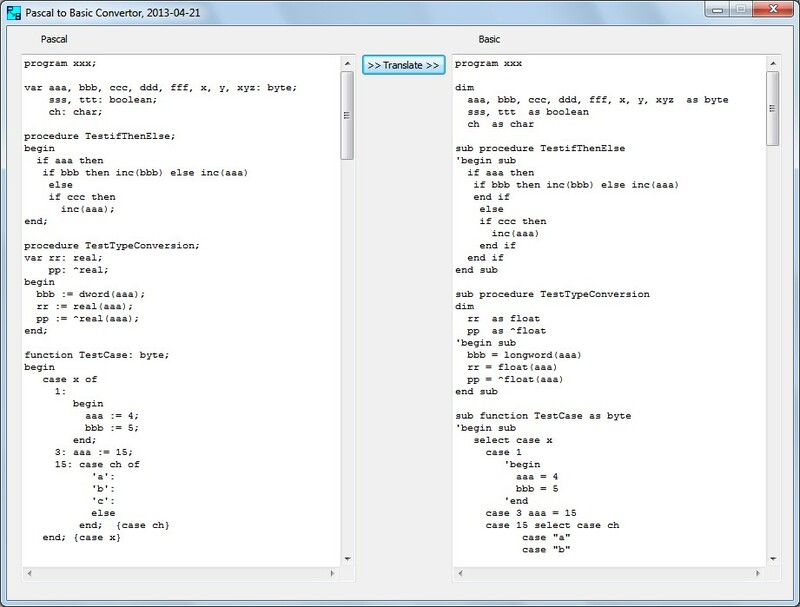 It can work as a standalone application or as a tool from IDE of all mikroE compilers. 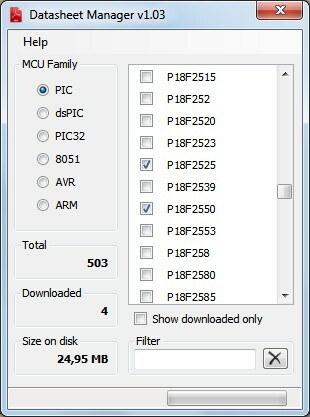 It allows you to filter/view/download/delete datasheets for all MCU families supported by mikroE compilers. 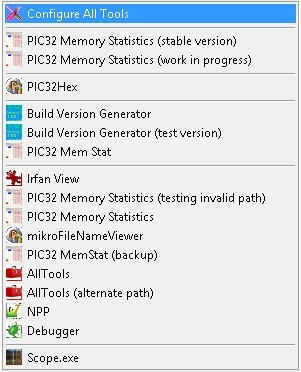 "BitCalc" is an extension of Quick Converter tool found in IDE for mikroElektronika compilers. Apart from numeric conversion, it provides access to bitwise operations along with graphical representation and interaction with bits. It should be of great help to beginners but even more experienced users could find it useful. Tool that shows the project's configuration words content, including the MCU type. This permits to add (part of) the configuration settings in a comment box in your project or a part of a forum post. Can read the configuration from a .cfg file or import it from the clipboard. Simple tool to calculate the timer prescaler value and the # of timer steps needed to obtain a certain time. 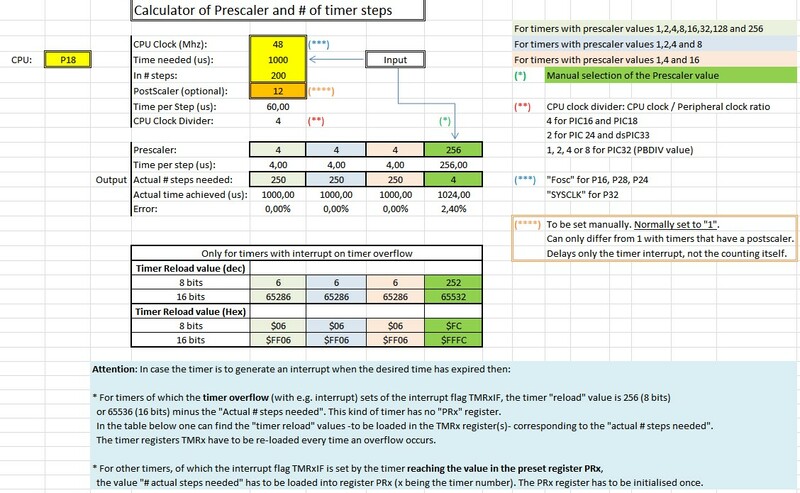 A "Calculator": calculates the prescaler and the needed # of timer steps, given the MCU frequency, the time wanted in the # of steps wanted and Postscaler value wanted. The calculation of the input frequency of a timer (both in MegaHertz and KiloHertz), given the MCU clock in Mhz and the value of the Prescaler. The calculation of the step time of a timer (both in microSeconds and milliseconds), given the MCU clock in Mhz and the value of the Prescaler. The "Range" of the 8 bits timers (both in microSeconds and milliseconds), given the MCU clock in Mhz and the value of the Prescaler. The "Range" of the 16 bits timers (both in microSeconds and milliseconds), given the MCU clock in Mhz and the value of the Prescaler. The "Time" a timer needs to make "x" steps. For 8 bit timers "x" is 0..255, for 16 bit timers "x" is 0..65535.
mikroPascal for PIC to mikroBasic for PIC source code convertor. Simple tool to convert Pascal source code into Basic code. Able to convert whole programs/units and also "loose" code (not embedded in units or programs), including assembly parts. A somewhat more extended version, based on the basic version of Joop. 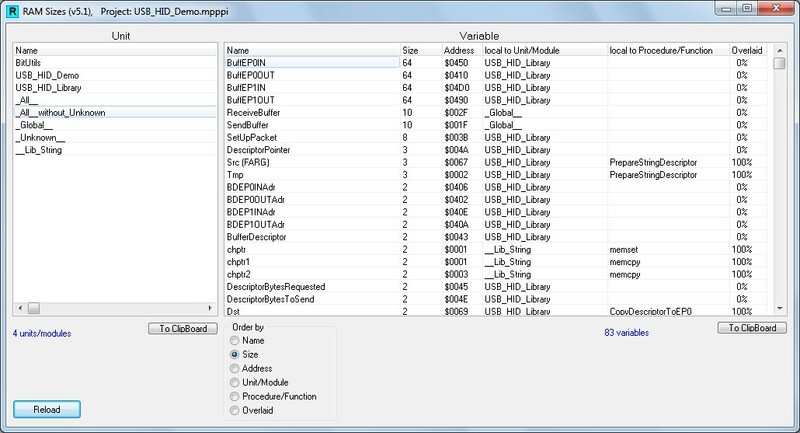 A PC application to access USB-CDC devices, written in Delphi. 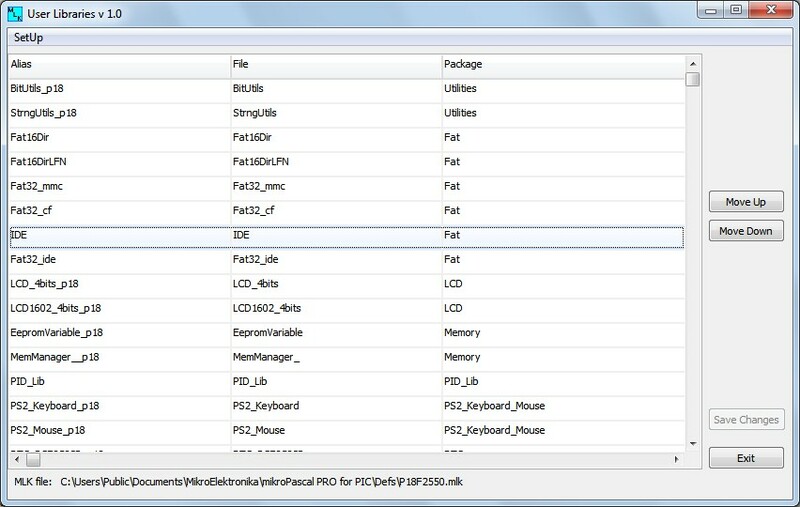 Delphi sources and executable are included. Pascal to C function prototype convertor. 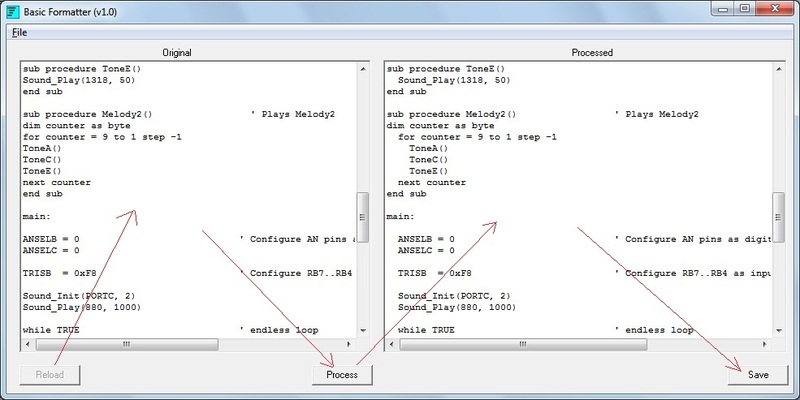 This is a tool capable of translating mP routine prototypes to C function prototypes (headers). Will be extended for other interfaced items soon. Very handy in translating e.g. unit "interfaces" of Pascal libraries that will be used with the mC compiler. It gives you the signatures of the interface in a known language (here mC). Important: Since there are considerable differences between mP and mC standard libraries, it may be possible that mP units which are using the mP standard libraries are nor usable with mC. 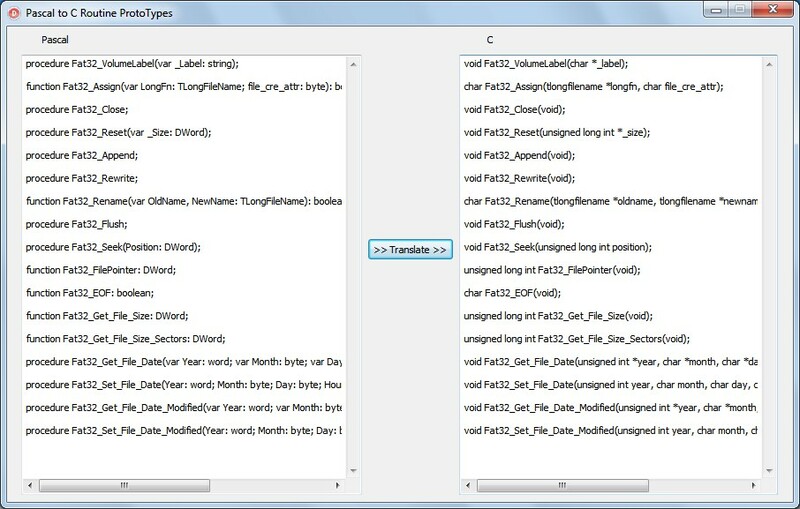 Project configuration in text format. 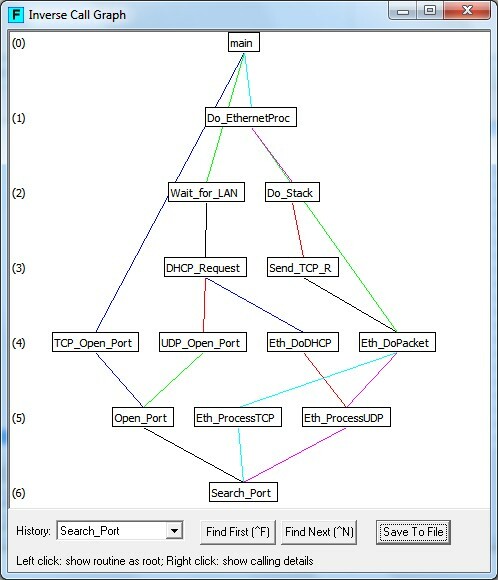 Tool that shows the project's configuration words content, the MCU type and the MCU clock frequency. This permits to add (part of) the configuration settings in a comment box in your project. The tool only works when invoked from the IDE. See below "Tool Installation" for the settings. For mP, mC and mB, PIC, dsPIC and PIC32. This tool permits to change the order of "user" libraries defined in the .MLK file of a certain processor. The correct order in the processor's .MLK file is needed because libraries that are "used" by others need to be defined "above" their "using" ones. The wrong order can occur if the "library dependancies" were not defined correctly or libraries were installed (usually manually) in a wrong order. This "correct" order of library definitions in the processor's .mlk file is only required if no source file is available or there are no "uses" statements in the source file. This tool shows the PIC data (PIC capabilities) derived from the CSV file in the MikroProg Suite directory (and used by it). This CSV file is installed together with the MikroProg suite installation. 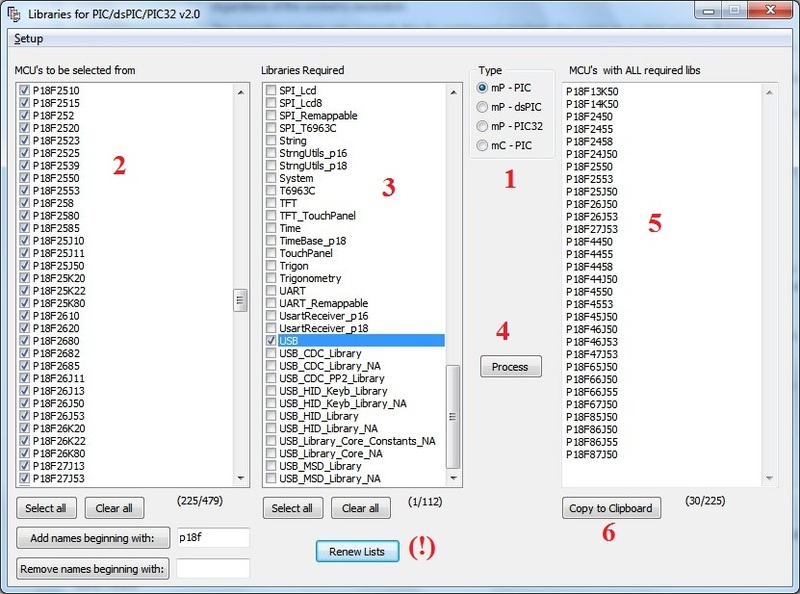 The tool permits to select MCU's that have a certain set of libraries available. This is important when developing libraries in packages that rely on the existance of other libraries. The output of the tool can be imported in the package manager (with "paste from clipboard"). Compiling libraries in mikroPascal. Compiling libraries with dummy projects in batch files. Library SwitchOver These 2 batchfiles can be used to switch over from Janni's replacement libraries to the original ones and vice versa. USBDeview is a small utility that lists all USB devices that currently connected to your computer, as well as all USB devices that you previously used. For each USB device, extended information is displayed: Device name/description, device type, serial number (for mass storage devices), the date/time that device was added, VendorID, ProductID, and more... USBDeview also allows you to uninstall USB devices that you previously used, disconnect USB devices that are currently connected to your computer, as well as to disable and enable USB devices. You can also use USBDeview on a remote computer, as long as you login to that computer with admin user. PC board diagnostic tool The ROCKKIT BOARD TESTER is an innovative and affordable IN-CIRCUIT board tester. For mP, mC and mB for PIC and dsPIC/PIC24. This tool shows the size of variables splitted up per unit/module and procedure/function. - Be sure that "Include Source Lines in the Output Files and Generate Listfile, include debug info" is checked in menu Tools -> Options -> Output -> OutputSetting. - Compile the project before tool usage. For mP, mC and mB for PIC, dsPIC and PIC32. This tool shows the romsize of all units of a project together with rom-size details of a selected unit. - Be sure that "Include Source Lines in the Output Files, Include ROM Constants and Generate Listfile, include debug info" is checked in menu Tools -> Options -> Output -> OutputSetting. For mP and mB, PIC and dsPIC. * Shows also which routines use a selected Global variable. For mP, mC and mB for PIC and dsPIC. Selecting a function in one view shows all its occurences in the other view. Double clicking a function goes "down" in the call stack in the "uses" view, and "up" in the call stack in the "is used by" view. Right clicking a function shows its call stacks in a separate screen. 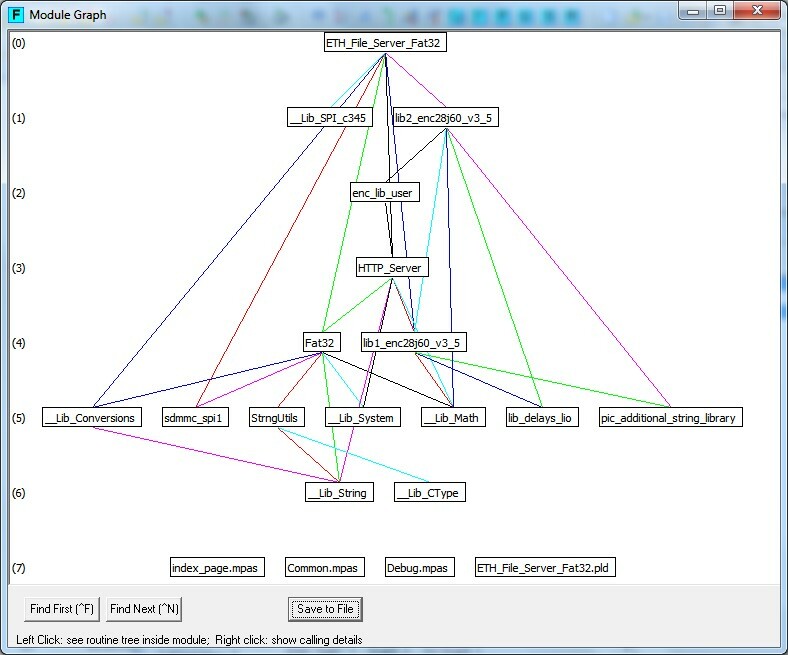 The call tree of the last selected function in one of both main windows can be shown graphically (and saved to a file). The call depth shown can be limited in the graphical view. One can click one of the procedures on the screen to see its caller tree, and go to previous procedures selected via the history. Single functions (and their callees) or all functions from specific libraries can be ingored in the graphicall call tree. 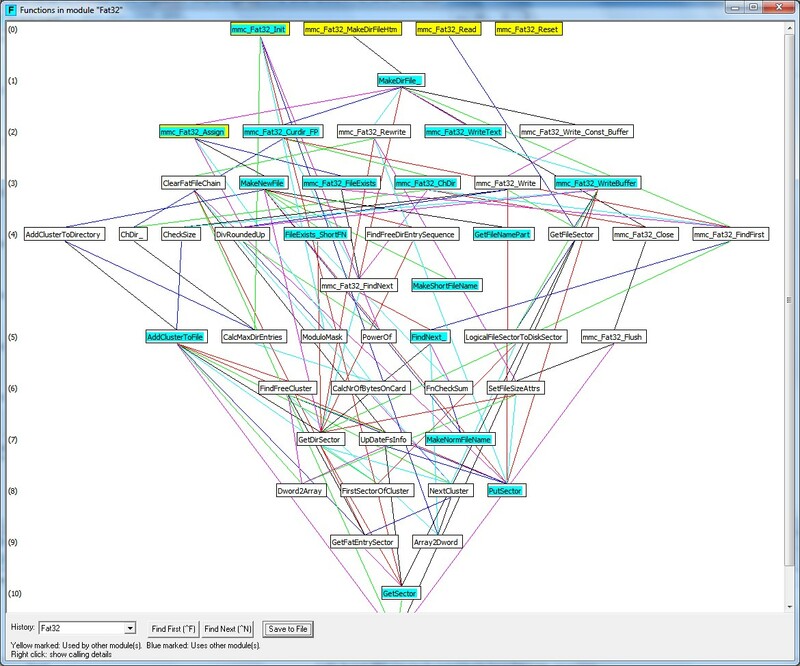 The inverse graphical tree (which routines do call the selected one) is also provided. 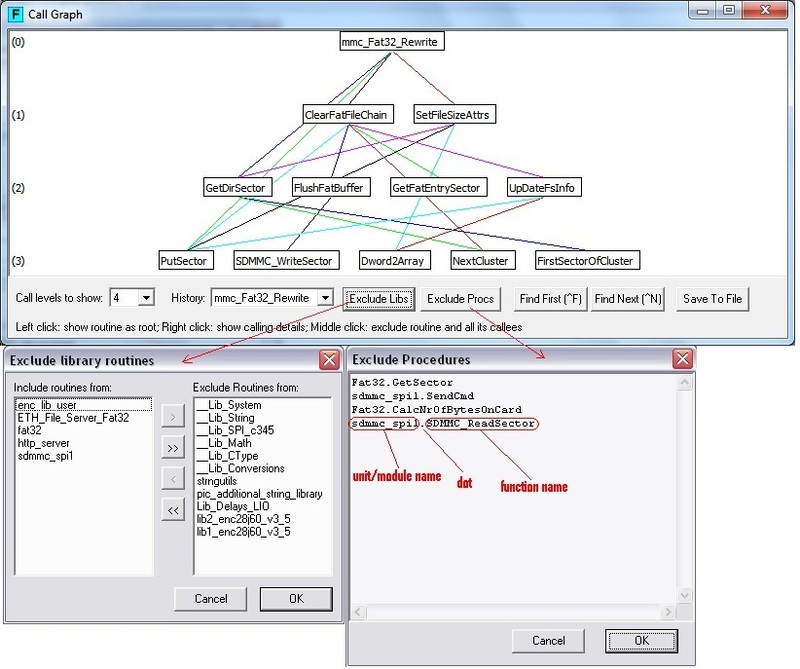 The Project's Module tree (which modules/units use other modules/units) and a Module's Routine tree (the call graph of all routines inside a module/unit) are also present. Keep in mind that all info that you see is that of the current project. This means e.g. that unused procedures are not shown! So: always compile the project before tool usage, the tool needs the listfile and the callertable. Tool settings in the IDE (Options-Tools). For mP for PIC and dsPIC. For: mP for PIC, dsPIC and PIC32. This tool enables you, in case of troubles, to delete the derived files (*.mcl etc...) in the project directories and the "Defs" directory. Additionally there is the possibility to check some items in the project file (*.mpppi), edit it if necessary, show the actual library filenames of libs checked in the library manager and show the project's listing file (*.lst). Also "Packages compliant" now from v14 onwards. PIC Timer Calculator by mikroElektronika. 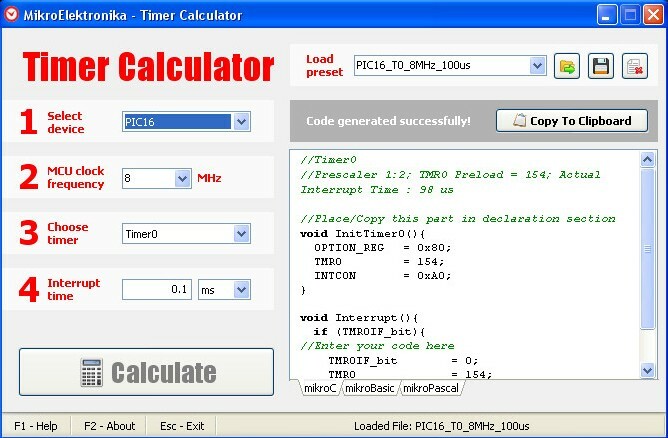 Timer Calculator is a software development tool used for easier calculation of timer interrupts. This software also generates source code compatible with mikroElektronika Compilers (mikroC, mikroPascal and mikroBasic) and for followinf MCu architectures: PIC16, PIC18, dsPIC30F, dsPIC24/33, PIC32, ARM Stellaris and ARM STM32. by "Dring Engineering services". PIC Timer Calculator and Source Code (Basic) Generator. by "Dring Engineering Services" Generates the Basic code needed for various interrupts on the PIC 16F877A. It should work for for similar chips with similar registers. PIC PWM Calculator & Code Generator This calculator will save you from insomnia and headaches ! It will help you to configure the PIC TIMER2 and PWM modules, you will also get a ready-to-use C source code (for mikroC compiler). by "Dring Engineering Services" Use the calculator to generate the parameters for the PWM Registers. It was designed for the 16F877A, but will work for all chips with the same Registers. It calculates the Registers for all possible values of the prescaler. by "Dring Engineering Services" Generates the initialisation and interrupt code (Basic) needed for different configurations for a few popular PIC's.